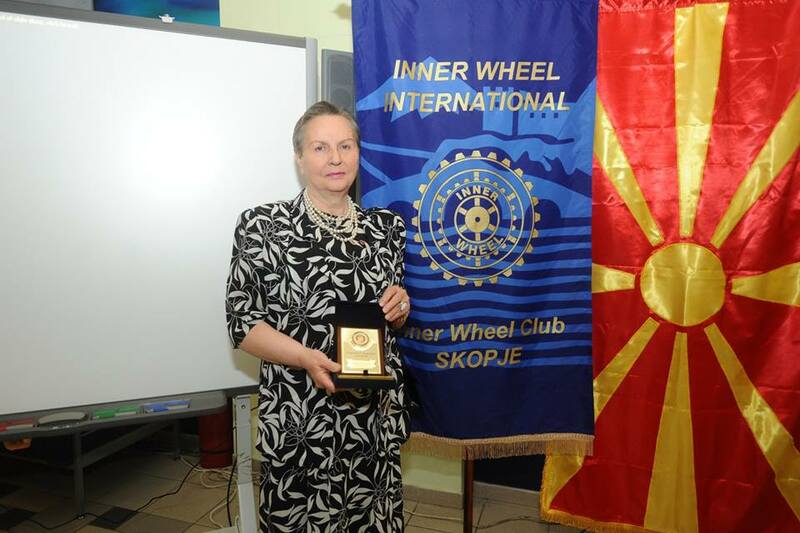 On May 27th, Inner Wheel Club of Skopje celebrates its 10th anniversary. 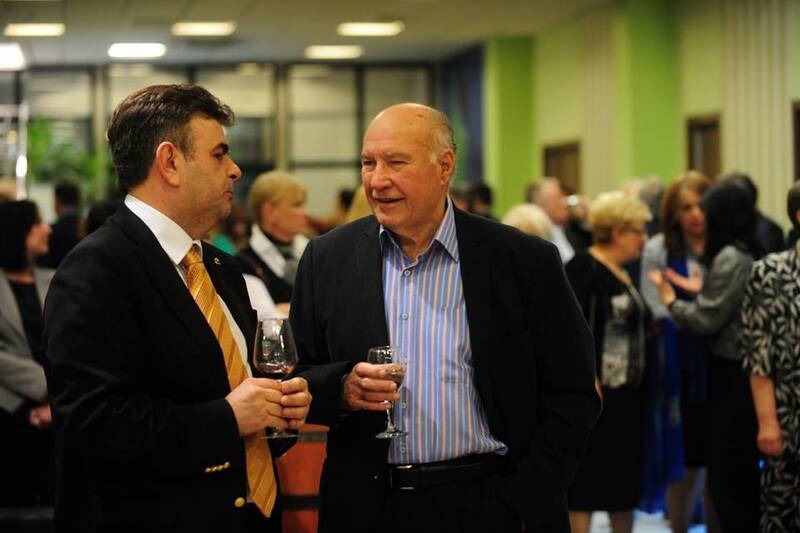 The event was held at the M6 Educational Center premises in Skopje, and the event was attended by many guests, former and present club members, members of the Rotary community from Macedonia, and distinguish representatives from the political elite and business community in Macedonia. 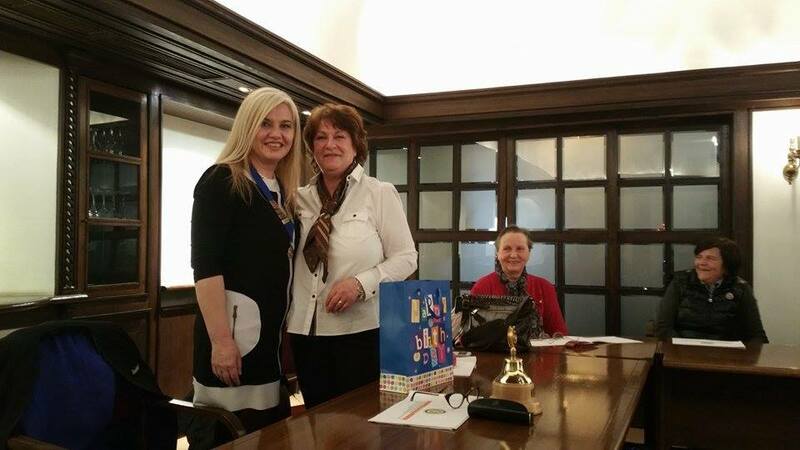 On the regular Club meeting held in Holiday Inn hotel in Skopje, new member in our club family was accepted - is Frosina Geceva Kocova. Besides that The Presidnet Aneta A. Pesheva make a presentation of the programme activity, which should be realized ‘till mid-June 2015. The first activity to come will be a donation of sheets and blankets in an elderly home in Skopje. Furthermore, the club members discussed the celebration of 10th years anniversary. Regular Club meeting was held on January 27th. The club members discussed about the future progrmme activities and goals for the period January-Maj 2015, with decision for bigger involvement in social and CRS activities to be made. Promotion of a book "The Story about Marija" written by Macedonian well-known politician Stojan Andov, took place in Skopje. The book is dedicated to his recently passed away wife who was a dedicated member of Inner Wheel Club of Skopje. Her friends and co-members of Inner Wheel Club of Skopje were there in honor of her family and her work. Our club members took a participation in a all day long business forum in Skopje, called Triple Biz. Inner Wheel Club of Skopje, was a partner in this event and our members participated in most of the forum's activities. The club President for 2014-2015, Mrs. Aneta Antova Pesheva, gives a speech to the audience, in which she present Inner Wheel, and the club activities. Under the auspices of the Inner Wheel fashion show was held in cooperation with Olgica Georgieva, fashion designer. The orphans and the director of the center "11 Oktomvri" attended the event, where they make a direct sales of many postcards. The amount of the donations will be used for their own purposes'. At this club meeting, the future activities and club involvement were discussed. Presentation of the "Send Love" postcards was made, and the club members decided this postcards to be used as a season's greeting cards. 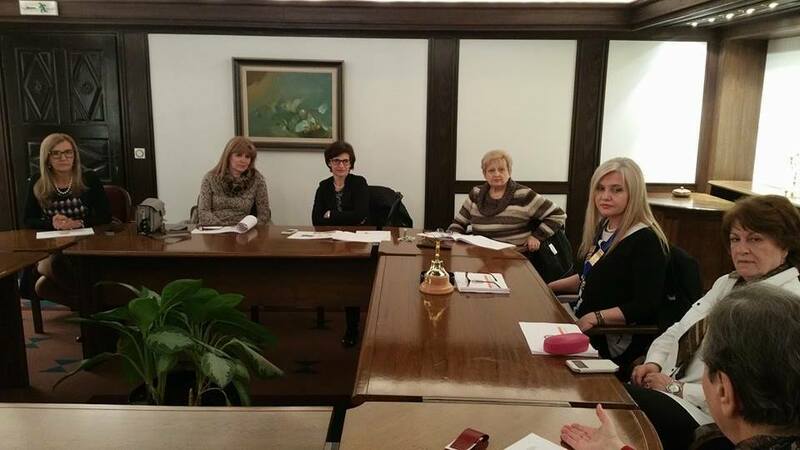 Inner Wheel Club members discuss about the cooperation with the Zonta International organization and participation in the campaign "End Violence against Women". Furthermore the club members agreed to participate in the Triple Biz forum in Skopje on November 26th. Inner Wheel club delegation visit the orphans center "11 Oktomvri" of Skopje. The club members had all day socialization with the center's residents and orphan's and participated in a creative workshop for postcards "Send Love", which was attended by many kids who expressed their creativity and motivation. On this meeting held in Holiday Inn hotel Skopje, the club members decided to announce a call for best photography, as a part of the Inner Wheel global campaign "Light the Path". Moreover, the club members decided to take a participation in the United Nations campaign "End Violence against women - orange your neighborhood", and express their support for organizing fashion show with humanitarian purpose, in cooperation with the fashion designer Olgica Georgieva. On the meeting held in Holiday Inn hotel, club members discuss the annual program. They decide the first activity to be held in Center for Orphans "11Oкtomvri" in Skopje. The activity "Send love" is about creating and drawing postcards, that after will be used as a Christmas and cards for the season's holidays. With this activity Inner Will intend to rise funds, that will be donated to the orphan's center "11 Oktomvri". Humanitarian action and donation in period July 1st 2013 to June 30th 2014. Farewell speech from members of Inner Wheel Club of Skopje to mark the loss of our respected and active member. Humanitarian action and donation in period July 1st 2012 to June 30th 2013. On June 25th IIWC of Skopje celebrated the day of our Charter with ceremonious lunch in restaurant "Dish"
Humanitarian action and donation in period July 1st 2011 to June 30th 2012. On May 27th IIWC - Skopje celebrated the day of our charter with socializing and lunch in Veles, together with the members of IIWC - Veles. Meeting with Mrs. Binota, wife of the PRC President of India, 14.06.2012. Humanitarian action and donation of food, hygene materials, stockings and second hand clotes, in the center for the homeless. Donation of two inhalers and one stetoscope for the childer clining of lung deseases "Kozle" in Skopje, 09.04.2012. Participation to International Inner Wheel Convention, Istanbul 2012. Discussion and exchange of experience with our guest of IW Wien, Ingrid Hilscher. 01.04.2012. Socializing in restoraunt "Dish" in Skopje, for the day of International Inner Wheel, 10.01.2012. Visit of the children clinic for lung deseases "Kozle" in Skopje to make plans and preparations for donation. Gala dinner and celebrating the day of our formation Inner Wheel Skopje, 16.12.2011. IIWC of Skopje donated two bus tickets (for whole year) for two sisters, students without parents. We helped the same students and donated drawing materials. Between 01.07.2006 and 01.07.2011 we didn`t put any activities of the IIWC of Skopje on our website. This was because we havent realise the full potential of the web and internet. This situation is not for excusse, but now we shall enter the activites as they happen (donations, lectures). IIWC from Skopje visited the old people from “Mother Teresa House” in Zlokukani and donated new coats and jackets. The children from the Shelter centar received sport shows and we offered them dental services. IIWC from Skopje, paid the full scholaship for two very prospective students. For the new year we donated a wasing machine in the children shelter center in village Zlokukani. We bought computer system for one boy and paid for a driving licence to other boy. We employed one boy in our club. Beds, daipers and food was donated to family with four twins. For 9 months baby at the schelter center “25 May” in Skopje we have donated clotes and food. Clotes was donated to single mother with student daughter. In Vizbegovo IIWC from Skopje donated blankets, sheets, new year decorations, clotes, foods and cosmetics. Donation was given to family with children. Rotary from Skopje aslo donated wood fire place. In a joint action with the Rotary Club in Skopje realized a donation to the Clinic for Pulmonary Diseases and Tuberculosis. Donations include blankets, sheets and fully equip a living room. IIWC Skopje renovated two rooms at the Institute for Rehabilitation. IIWC – Skopje sponsored a trip to Russia for a great student in order to extend the studies. In the village of Vevcani we donated 5 beds and 7 sheets for a family with 7 childrens. Accomplished a friendship with IIWC-Beyoglu Istanbul. During the visit of IIWC-Beyoglu Macedonia, we made a visit to the winery Fonko in Kavadarci. 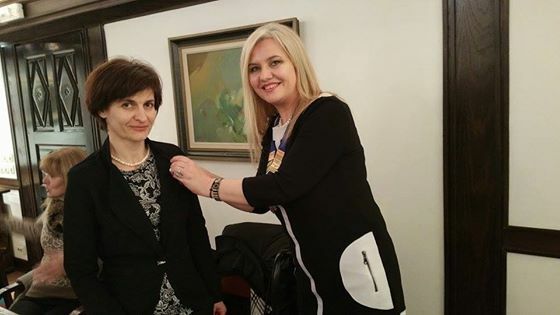 Accomplished a great friendship with IIWC Belgrade (club sponsor). We visited their club. Accomplished a great friendship with Fonko winery during the tree day initiative. 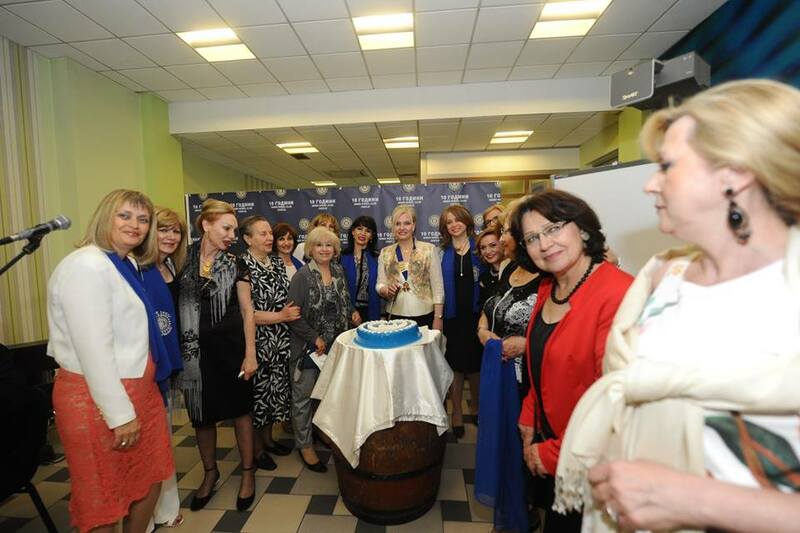 The celebration of the 5th anniversary of IICB and 4th anniversary of IIWC was held in Belgrade. Another action in the shelter center, with a donation of clothing. Celebrated the installation of tile on the wall of IIWS Karpos hotel, where are the Headquarters of our club. IIWC Skopje sponsored the charte of IIWC from Bitola. In March 2011, in Skopje IIWC sponsored the charte of IIWC Veles. Donation for four graduates, excellent students from the High School “Georgi Dimitrov”. For the earthquake in Haiti we donated 200 Euros. For the operation of the 3 year old child in France we donated 1000 Euros. For the operation of the 5 year old boy in Bulgaria we donated 200 Euros. In primary school "Zivko Brajkovski" from Butel municipality, IIWC from Skopje donated two portable toilet doors. In the National Kitchen "Mother Teresa" in “Kisela Voda” we donated food for 63 people. In the "Children's Village" in the settlement “Cento” we donated a machine for washing clothes. In the center for the homeless we donated hygiene and used clothing. Donation was made through the Red Cross. Used clothes are donated to two students without parents who are living with their aunt. 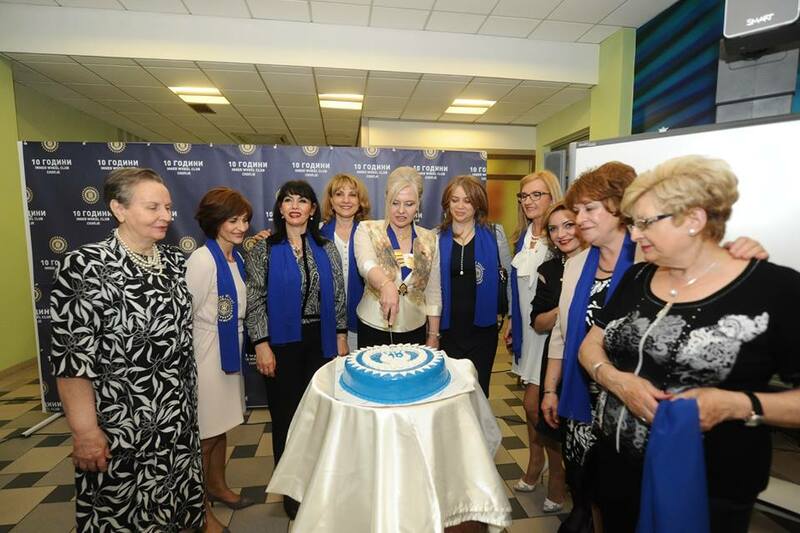 On May 27 IIWC – Skopje celebrated the day of our charter with socializing and lunch in Skopje. Donated funds for student travel in Italy. The Institute for Lungs diseases, yesterday has been donated by Rotary Club Skopje. The donation included blankets, linens, tables and chairs, amounting 3000 Euros. This humanitarian action has been realized and initiated by the Association of citizens for promotion and development of humanity and friendship “Inner wiheel” organized by spouses of Rotarians that handed over the aid. Mrs Ani Vidoevska, the head of the Institute expressed her gratitude and emphasized that this aid will contribute to equip the living room and the dining room that will be opened soon. Hundred pairs of shoes tomorrow will be given to the old people in the “Mother Tereza Home” in Zlokukani, as a donation of NGO “Inner wheel”Skopje. Mrs Marija Jurukova, the President of the Association, seas that during the previous visit they have asked for shoes and now they will have the oppoprtunity to get comfortable shoes for spring walks. Mrs Jurukovska announced soon several humanitarian aid. The story of sole mother Slobodanka Georgieva, art pedagogist that has lost her job and her four children written in the dayly newspaper “Dnevnik” has encouraged many people from Macedonia. Some of them has payd the electricity bill of over 30.000 denars. Also, three representative of “Inner wheel” Skopje have visited her yesterday. They donated several parcels of food, cloths and some money. The Start emloees form Ohrid have sent the Christmas tree and many presents.Mrs Violeta Misevska was one of many that has helped this family. Winter coats, suits, get older persons from Mother Teresa House, Zlokukani as new year gifts from NGO International Inner Wheel of Skopje. A dozen of children accommodated in the Shelter Center for women and children victims of family violence, were donated with parcels of food by the Bakery “Specijal” for the New Year holidays. The parcels contain bakery products and cookies. The NGO “Inner- wheel” will donate clothes for the children. The children are very satisfied having Santa Clause visiting them. For this occasion they have written a desire letter for the next year. International Inner Wheel of Skopje visited Shelter Center and donated the help from the rotary member Vlado Todorovic - Tinex. The help was baby dipers and food. Textbooks, notebooks and food for the Shelter children. Several children attending elementary school form the Shelter Center were donated with notebooks, textbooks, school bags and school accessories by the NGO “Inner will” Skopje. Also they were donated food by the Bakery “Specijal” for the successful end of the school year. The children that most of the time spent in the Shelter Center, yesterday had the opportunity to enjoy two hours playing and eating in one of the Skopje playing grounds. Ms. Daniela Dabevska, head of the Shelter Center, stated that it is very difficult to take care for children exposed to fears and poverty. She emphasized that this donation was the biggest attention they have ever received. On this occasion the donors NGO “Inner wheel” , the Bakery “Specijal”, Dnevnik newspaper and the Agency for youth and Sport, that traditionally provides several days summer holiday for the children, were given Certificates of Appreciation for their aid. The children in the Shelter Center, have finished their 7 days holiday in Ohrid. Traditionally this summer holiday are financially supported by the Agency for Youth and Sport. This year the children were also donated with bathing suits and water requisites. The NGO “Inner wheel” Skopje this year provided clothes and summer accessories. For most of the children this was the first summer experience in their life. It should be emphasized that the initiation and realization of this action was made by the “Vecer” newspaper. The children had the opportunity several days to live and feel like children. They are victims of family violence and they miss many things, one of them is the care and attention, but this time they got it from people that have proved that philanthropy is not only a value for the foreigners in Macedonia. On the occasion of celebration of March the 8, the representatives of the NGO “Inner wheel” Skopje have visited the “Majka Teresa” Home for old people in Zlokukani and have given presents as sleepers, socks as well as fruits and cookies. They expressed their satisfaction and e happiness with applause. The Association “”Inner wheel” has been founded two months ago and this was their first humanitarian action. About 10 children from the Shelter centar for woman and children yesterday received gifts of towels, bathing suites, sun beds, water balls, and other things for the summer holiday. The gifys were donated from the NGO International Inner Wheel of Skopje. On the occasion of 8th of March, members of the association of citizens Inner Wheel of Skopje visited the Home for Elderly Mother Teresa in Zlokukjani and to the tenants were given appropriate gifts. Pair of home slippers and socks were given to women but also to men, and were honored with bananas and sweet. The gifts, the inhabitants of Mother Teresa returned with a loud applause and happy faces. Inner Wheel Association was established two months ago and this is their first humanitarian action.